Reader Response | Welcome to Virgin Territory! VIRGIN TERRITORY was published in March 2010. I’m updating this page on December 16, 2013, surprised and gratified that I’m still receiving reader feedback. I haven’t done a lot to promote VIRGIN TERRITORY, but evidently it’s finding a readership through word of mouth. I´m grateful for the readers who take time to tell me directly what the book has meant to them. And a BIG thanks to those who post their comments on Amazon! I’m full of awe, envy, admiration & appreciation. LOVE it. The writing is terrific, a seamless blend of anecdote, confession, backstory, and analysis of what we take for wisdom. Very impressive. I’ve read a lot of “I moved to Mexico” books, but yours tops all. Whew!! And to think I nearly gave the Women’s lunch a miss. Please save me 5 from your dwindling supply–I can think of that many readers and more. Susan: I have been slowly working myself through the books I’ve wanted to read since we left Mexico. Among them was yours, and it was a delightful read. I not only learned a great deal about the Virgin of Guadalupe, but all about you and your life. I was impressed by your candor, particularly in terms of your struggle with your faith, and the health issues you faced after your move to Mexico. The interweaving of the Mexican aspects of the book with your own thoughts and experiences worked well, (frankly much better than I would have imagined if someone had explained it to me beforehand). The responses above were taken from unsolicited emails and letters. Here is a response, warts and all, from a British book editor. Dear Susan: Jan DeLacy recommended your book, which I downloaded on Kindle and read on the plane en route to Italy. The best way to read it – in one sitting. So much of what you mention I can relate to. The struggles with a Christian Science way of life has me wondering some times. Physical challenges and the way Christian Scientists deal with them are not always as cut and dried as we have been taught. Thanks for your honesty and “coming out” as they say these days. Such a great help! I’m going to read it again. Noticed so many “feminine” qualities in Italy while spending three weeks there recently. Santa Maria is everywhere! Thanks for writing, Doug. It’s so good hearing from men. 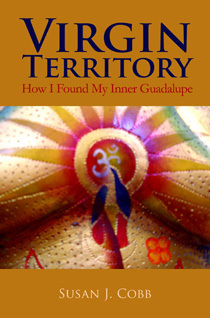 I’m working on a blog post about guys in touch with their Inner Guadalupe. It’s becoming clear to me that that term really refers to the authentic, un-invaded, unbroken and totally intact core of everyone’s being. Virgin qualities. Now exploring what LIVING from that place entails….oh, man! Thanks, Jan. You’re RIGHT. It was difficult. Had a wonderful editor who kept dragging it out of me, demanding more of the story. But, whew, it feels good having it OUT there. Thanks for your support!